Hi there! Today I”m sharing in the cover reveal for the third book in Karen Stivali’s Moments in Time series. As you may remember, I loved MOMENT OF IMPACT and MOMENT OF TRUTH…so I’ve been waiting for MOMENT OF CLARITY to get out here already! MOMENTS IN TIME is the paperback version and contains all three novellas (Moment Of Impact, Moment Of Truth and Moment Of Clarity) in one volume. Both will be available May 6th. Interested? Both books are available for pre-order at Dreamspinner Press. Find Moment of Clarity in eBook, and Moments in Time in Paperback. If you haven’t read the first two books in this series, you may want to catch up before MOMENT OF CLARITY drops. 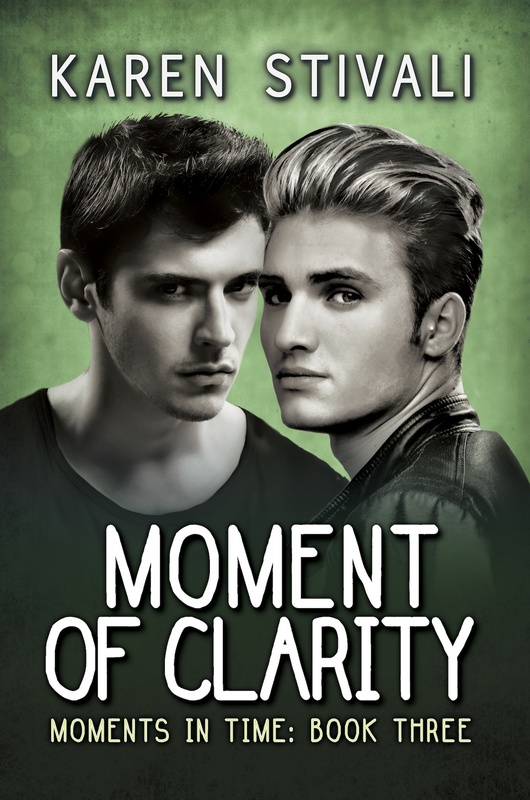 Check out my reviews of both MOMENT OF IMPACT and MOMENT OF TRUTH where you can also find the buy links! Congrats to Karen on the cover reveal!